Lon Cerel does - for a living. "It still excites me," said the magician and balloon artist during a recent interview. "Especially performing to young children. I cannot get it out of my mind that it's probably their first magic show (and) their first live performance. It still excites me to watch it through their eyes." "Magic is make-believe," he said, and he uses that idea to urge children to make-believe their dreams. "If you wish a dream and want it to come true and you work hard, it will come true." Cerel is celebrating his 30th anniversary as a professional magician this year - despite graduating from Providence College in 1978 with a degree in psychology. "I was going to be a doctor but was already making money doing magic shows," he said. "And I've been doing it ever since. Magic has been kinder to me than I ever anticipated." Cerel, 51, who lives in Johnston, grew up in Pawtucket and said he was always fascinated with magic. He got his start on his 10th birthday when his grandmother gave him a Martian Magic Tricks set based on the 1960s TV sitcom My Favorite Martian starring Ray Walston as a Martian stranded on Earth. He has a boxed copy of the set in his office. And as time went by, he said he found he could compensate for his lack of athletic skills at school through . . . comedy and magic. "Then in 1971, when he was 14 years old, he fell under the spell of the stage when his family vacationed at Brown's Resort in the Catskill Mountains in upstate New York. Brown's, which was recently converted into condominiums, was one of many Jewish-owned resorts that flourished in the Catskills in the last century. Many comics and musicians got their start or regularly performed at so-called Borscht Belt (as in the Russian soup popular with Ashkenazi Jews from Eastern Europe) resorts such as Brown's, including Woody Allen, Mel Brooks, Rodney Dangerfield, Jerry Lewis and Joan Rivers. Cerel was befriended by comedian and violinist Henny "Take my wife - Please" Youngman. "Because of Henny, I became a star struck kid," he said. "He always called me kid and kept in touch." So after graduating from PC, he went on stage opening for Youngman at shows in New England and New York. Youngman, who was renowned for his work ethic and business acumen, typically gave a short show packed with one-liners. Cerel said he brought him in to fill in the time. "Henny did not want to do a full hour," he said. "He'd tell the club, 'After 5 minutes I bring out this kid, he's funny and does magic for 20 minutes. Then I come out . . . and not charge you for the kid.' "
Cerel's association with Youngman lasted until Youngman's death in 1998, and he has one of his violins encased in glass and mounted on a wall in his home. Apart from giving him a start in show business, he said, Youngman taught him the business side of show business. "Henny showed me how to market (my act) as a business," he said. Or, as Youngman was famous for saying, "Nem de gelt," Yiddish for "Get the money." 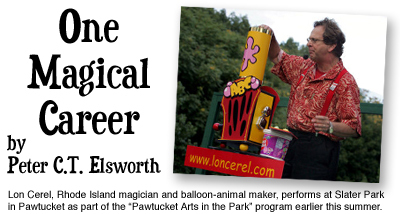 Cerel said the other great influence on his career was "The Windy and Sunny Magic and Balloon Show," a New England husband and wife (Russell Douton and Maryellen Nelson) team of magicians and "balloon-a-tics" who mix their magic act with balloon animals. These days, Cerel typically combines magic, balloon sculpture and humor in his shows. He has honed his act down to a fine art and is able to have a room of rambunctious children eating out of his hand within seconds. He almost immediately gets audience members involved and provides a constant stream of one-liners, many of them directed toward the adults in the audience. Cerel said few shows are perfect. "I make small missteps all the time," he said. "But the audience doesn't know what you're going to do, so you can change the ending." And yes, he does have a rabbit - a Mini Rex whose stage name is Hare E. Potter but who is more familiarly known as Bunathon - which he brings out at the end of his act. Asked why magicians always use rabbits (and doves), he said, "Have you ever tried traveling with a giraffe?" Early in his career, Cerel spent several weeks a year touring through such states as Alabama, Georgia, Indiana, Kentucky and Tennessee for Canton, Mass.-based Hills Department Stores. "All over creation," he said. "Forty-two stores in forty-two cities in five or six weeks." Today, Cerel said he is happy to work close to home. "I work as much as I want to work," he said, going through his appointment book which was filled through weeks ahead. Cerel's office in his Johnston home is packed with memories of his years in show business. "I like little bits of history," he said. Photographs and posters line the walls, including those of such Borscht Belt comics as Milton Berle, Sid Cesare and, of course, Henny Youngman. There are letters signed by Harry Houdini, the magician and escapologist, who is one of Cerel's heroes. He also has posters from The Magic Show, which Canadian magician, illusionist and escape artist Doug Henning brought to Broadway in 1974. That was followed by Doug Henning's World of Magic, which aired on NBC in the 1980s. Cerel said he was lucky in the early years of his career because not only had Henning, who was a flamboyant show-man, reinvigorated interest in magic shows, but comedy clubs were all the rage. "It seemed like every bar in Rhode Island became a comedy club," he said. Looking somewhat like Henning at the time, with long hair and a moustache, he honed his craft at numerous clubs in the area. "When I graduated, there were 100 places to be bad," he said. By the mid-1980s, he said, many of the clubs were closed. He started playing at such public venues as state and county fairs and shopping malls, as well as continuing to provide magic shows for family and children's birthday parties and Christmas and corporate parties. He was recently voted the "Best Entertainer for a Birthday Party" by Family Favorites, Rhode Island Parents' Paper, for the third year in a row. He has performed every summer at Slater Park in Pawtucket and the Warwick Mall - "three shows a day for four or five days" - for the last 30 years and regularly plays at county fairs in Massachusetts. He said his was the most repeated act in the history of Topsfield Fair in Topsfield, Mass. The fair, founded in 1818, is the oldest agricultural fair in the United States. Cerel met his wife, Sandy, in 1983 at the Kaleidoscope Children's Theatre Company in Cranston. "I asked her to marry me in 1986 and in 1999 she said yes," he said. She had a son by a previous marriage and now they have a grandson, Stephen, who is 11. The couple have developed "The Magic of Reading," a program geared for elementary schools focused on reading and based on a curriculum of popular children's books mixed in with lessons such as the importance of sharing and cooperation, and building self-esteem. "Books open the world," he said. "You can travel in your bedroom." For more information, go to www.loncerel.com.